Consider today’s blog to be more like a public service announcement. I am sure it’s no secret that the word wide web knows a lot about each and every one us and it’s not all related to social networking sites. 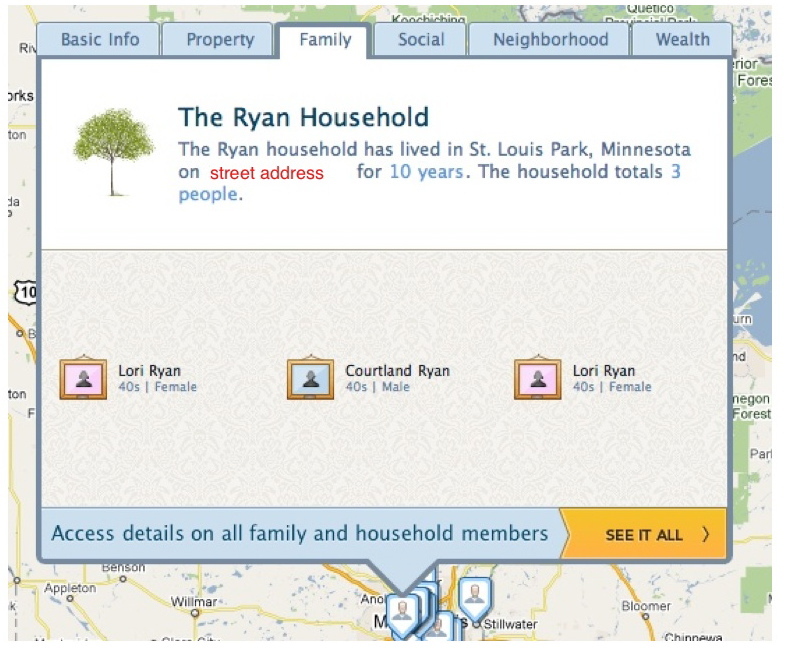 Did you know there are websites compiling information about you and sharing it with the world, no sign up required? 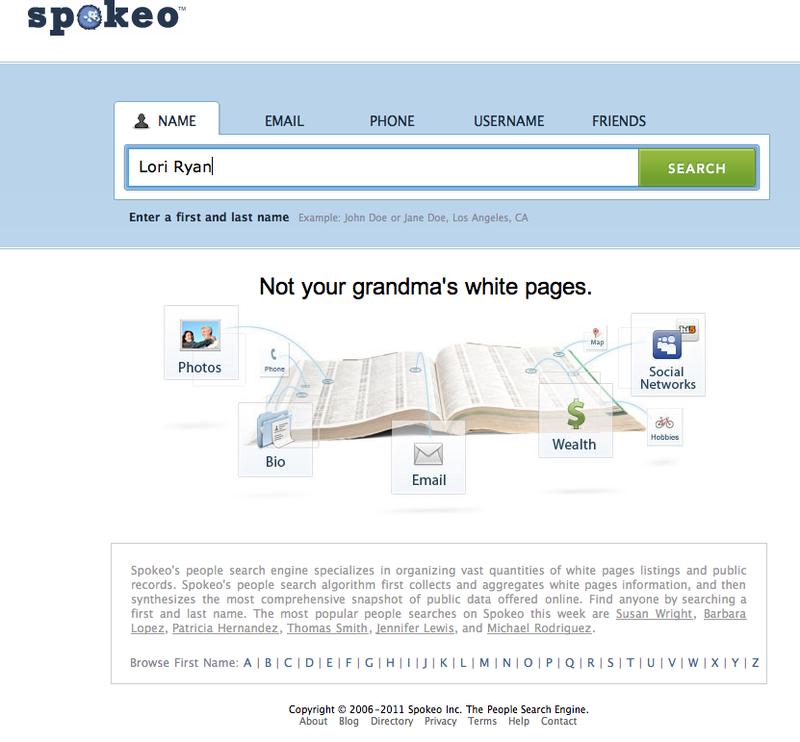 Ever heard of a website called Spokeo.com? I just learned about it on Sunday. Maybe I am just one of the last to know, but by golly, this website knew all about me and it probably knows all about you too. And that’s just the information available for free. Wait until you see what you can learn about your friends, strangers or even enemies if you are willing to pay a small fee. Here is the home page. Notice the phrase… “Not your grandma’s white pages”. If you haven’t done so already, go to their website and call up your name. So I typed in my name. I wanted to see what people could find out about me, true or not. The red typing is my own, covering up the information I like to think is private, even though I am sure it is not. 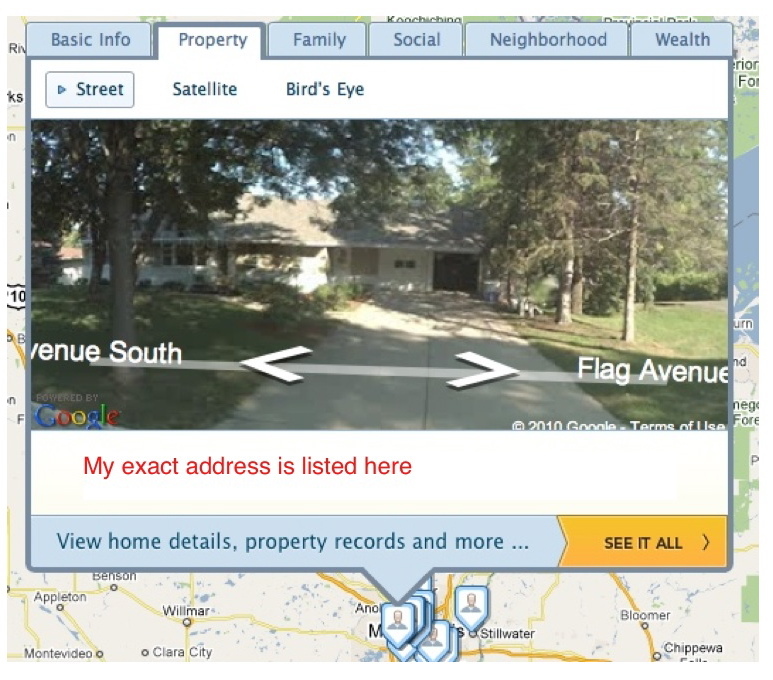 Notice the tabs on top: Basic info (the page above) property, family, social, neighborhood and wealth. I found some of the information to be accurate but not all of it. Where I live was correct. You can actually see my house. Who lives in my house? Wrong! This website has two of me. Wouldn’t my husband love to know I have been cloned. As for hobbies, music probably came up because the computer can see all of my purchases on iTunes. I am not sure where the basketball came in. When we Spokeo’ed (my new word) my husband, his hobbies came up as Travel and Cooking. We think it might be connected to his magazine subscriptions. As for wealth, what Spokeo listed for us was not even close. We could only wish! Right or wrong, I don’t feel comfortable having all of this information so easily available. Yes, I am sure it’s still out there, Spokeo or No Spokeo, but I would prefer if people had to work to find it. 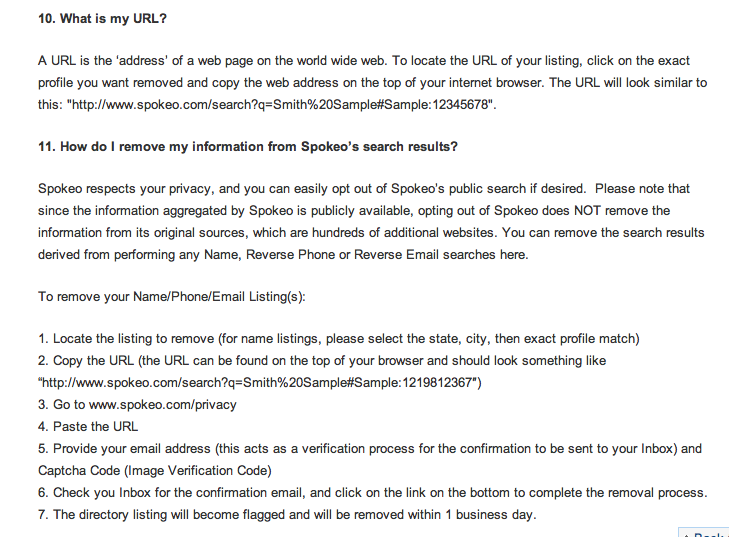 So below are the steps to make your information private on Spokeo if you so choose. I had to go through the steps twice since there are two of me. Who knows if I even did it right? But at least I can help get you started. First, locate the privacy button in the lower right corner of the screen. Once you get to the privacy page, you’ll be asked for a URL. I had to find out what that was. I had no idea. Best of luck. And I want you all to know, I did not search anyone’s name except my own family members and only to get a sense for how accurate the information is. A family member, who I know for certain, doesn’t have a Facebook page and doesn’t even use the internet, somehow had his/her info on Spokeo. So this isn’t just limited to people who are on social networking sites. My son does have a Facebook page and thankfully, he didn’t show up in the search. This website is dated 2006. So I am guessing, many of you may already know about this. And if you are aware of other websites that are similar please share. Personally, I feel like these websites should get permission from us, before they post our information. It shoudn’t be our responsiblity to find out about the websites and then request privacy. ← How do you say “I love you”? In addition to being publicly available with a paid subscription you can gain access to photographs and other things on this sites. I know of a few human resource departments that look for “innapropriate” pictures on people’s social networking sites as part of their employment screening process. It’s important for all of us to take the time to read privacy policies and adjust our settings where we can on the various social networking site. Enjoying your blog very much. There arre specific breeds lower susceptible to chocolate however never give your dog chocolate by choice. Go ahead. Well, everyone with dogs wants to be like Amtrak.